Carolyn Conner Seepersad is a Professor of Mechanical Engineering and General Dynamics Faculty Fellow at the University of Texas at Austin. 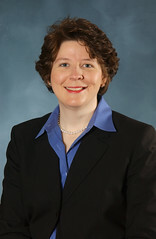 She received a PhD in Mechanical Engineering from Georgia Tech in 2004, an MA/BA in Philosophy, Politics and Economics from Oxford University in 1998 (as a Rhodes Scholar), and a BS in Mechanical Engineering from West Virginia University in 1996. Dr. Seepersad’s research involves the development of methods and computational tools for engineering design and additive manufacturing. Her research interests include simulation-based design of complex systems and materials, design for additive manufacturing, innovation, and environmentally conscious design of products and energy systems. Dr. Seepersad has earned many awards for her research and teaching, including the 2009 inaugural International Outstanding Young Researcher Award in Freeform and Additive Manufacturing from the additive manufacturing community, the 2010 University of Texas Regents’ Award for Outstanding Teaching by an Assistant Professor (the highest teaching award for faculty in The University of Texas System), the 2010 Outstanding Young Investigator award from the ASME Design Automation Committee, and the 2013 ASEE Outstanding New Mechanical Engineering Educator award. Dr. Seepersad is the recipient of a Best Paper Award for the 2009 ASME IDETC Design Theory and Methodology Conference, the 2015 ASME IDETC Design Education Conference, and two best paper awards for the 2010 ASEE Annual Conference and Exposition. She is also the author of more than 100 peer-reviewed conference and journal publications and one book. She co-organizes the annual Solid Freeform Fabrication Symposium, and she is a member of the executive committee for the ASME IDETC Design Automation Conference (2015 conference chair). She has also been a participant (2010) and session organizer (2011) for the annual NAE Frontiers of Engineering Symposium, a symposium organized by the NAE for a select group of emerging engineering leaders ages 30-45, an invited speaker for the 2013 German-American FOE, and a keynote speaker for the 2015 International Conference on Engineering Design (ICED). Her research has been featured by Popular Science, Science Daily, The Daily Dot, 3DPrint.com, and various additional media outlets. She teaches courses on product design, additive manufacturing, and design of complex engineered systems. Correa, D.M., C.C. Seepersad, M.R. Haberman, 2015, “Mechanical Design of Negative Stiffness Honeycomb Materials,” Integrating Materials and Manufacturing Innovation, Vol. 4, No. 10, pp. 1-11. Correa, D.M., T.D. Klatt, S.A. Cortes, M.R. Haberman, D. Kovar, and C.C. Seepersad, 2015, “Negative Stiffness Honeycombs for Recoverable Shock Isolation,” Rapid Prototyping Journal, Vol. 21, No. 2, pp. 193-200. Backlund, P., D.W. Shahan, and C.C. Seepersad, 2014, “Classifier-guided Sampling for Discrete Variable, Discontinuous Design Space Exploration: Convergence and Computational Performance, Engineering Optimization, Vol. 47, No. 5, pp. 579-600, DOI:10.1080/0305215X.2014.908869. Telenko, C. and C.C. Seepersad, 2014, “Probabilistic Graphical Modeling of Use Stage Energy Consumption: A Lightweight Vehicle Example,” Journal of Mechanical Design, Vol. 136, No. 10, pp. (101403)1-11. Seepersad, C.C., 2014, “Challenges and Opportunities in Design for Additive Manufacturing,” 3D Printing and Additive Manufacturing, Vol. 1, No. 1, pp. 10-13. Johnson, D.G., N. Genco, M.N. Saunders, P. Williams, C.C. Seepersad, K. Holta-Otto, 2014, “An Experimental Investigation of the Effectiveness of Empathic Experience Design for Innovative Concept Generation,” Journal of Mechanical Design, Vol. 136, No. 5, pp. 051009 (1-12). Fulcher, B.A., D.W. Shahan, M.R. Haberman, C.C. Seepersad, P.S. Wilson, 2014, “Analytical and Experimental Investigation of Buckled Beams as Negative Stiffness Elements for Passive Vibration and Shock Isolation,” Journal of Vibration and Acoustics, Vol. 136, No. 3, pp. 031009 (1-12). Oman, S.K., I.Y. Tumer, K.L. Wood, and C.C. Seepersad, 2013, "A Comparison of Creativity and Innovation Metrics and Sample Validation Through In-Class Design Projects," Research in Engineering Design, Vol. 124, No. 1, pp. 65-92. Shahan, D. and C.C. Seepersad, 2012, "Bayesian Network Classifiers for Set-Based Collaborative Design," Journal of Mechanical Design, Vol. 134, No. 7, 071001 (14 pages). Telenko, C. and C.C. Seepersad, 2012, "A Comparison of the Energy Efficiency of Selective Laser Sintering and Injection Molding of Nylon Parts," Rapid Prototyping Journal, Vol. 18, No. 6, pp. 472-481.